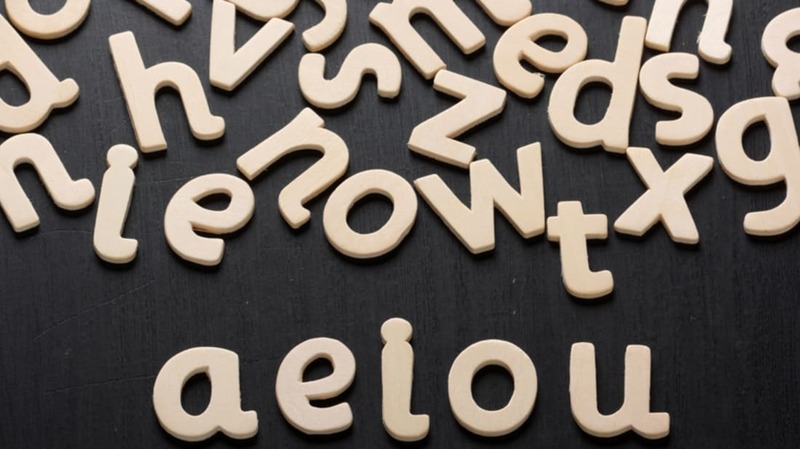 A, E, I, O, U and sometimes Y is not all you need to know about vowels. There's more to these workhorse members of our linguistics inventory than you might think. 1. ENGLISH HAS MORE VOWELS THAN THERE ARE LETTERS FOR THEM. A, E, I, O, U and sometimes Y are the letters we define as vowels, but vowels can also be defined as speech sounds. While we have six letters we define as vowels, there are, in English, many more vowel sounds than that. For example consider the word pairs cat and car, or cook and kook. The vowel sounds are different from each other in each pair, but they are represented by the same letters. Depending on the dialect, and including diphthongs, which are combinations of two vowel sounds, English has from nine to 16 vowel sounds. 2. THE MOST COMMON VOWEL IS SCHWA. The most common vowel sound in English doesn’t even have its own letter in the alphabet. It does have a symbol, though, and it looks like this: ǝ. It’s the "uh" sound in an unstressed syllable and it shows up everywhere, from th[ǝ], to p[ǝ]tato, to antic[ǝ]p[ǝ]tory. You can discover nine fun facts about it here. 3. YOUR SPANISH SOUNDS AMERICAN BECAUSE OF DIPHTHONGS. In addition to pure vowel sounds, there are diphthongs, where the sound moves from one target to another. American English is full of them. The vowel in the American pronunciation of no is a diphthong that moves from o to u (if you say it in slow motion, your lips move from a pure o position to a pure u position). The vowel in the Spanish pronunciation is not a diphthong. It stays at o, and that what makes it sound different from the English version. 4. SOME SOUNDS CAN BE EITHER VOWELS OR CONSONANTS. The u sound (pronounced "oo") is a vowel. It allows an unrestricted airflow through the vocal apparatus. Consonants, in contrast, are created with a blockage of air flow, or point of constriction. A u sound can sometimes serve as that point of constriction, and it that case the u is considered a w. In the word blue, the u is the most open part of the syllable, and a vowel. In want it is the constriction before the main vowel, and thus a consonant. Similarly, an i (or “ee”) can also be a y, which helps explain why is Y a sometimes vowel. 5. MOST LANGUAGES HAVE AT LEAST THREE VOWELS. Most languages have at least i, a, and u, or something close to them, though it may be the case that the extinct language Ubykh had only two vowels. It is hard to say what the highest number of vowels for a language is because there are features like vowel length, nasalization, tone, and voicing quality (creaky, breathy) that may or may not be considered marks of categorical difference from other sounds, but in general, 15 seems to be a pretty high number of distinct single vowels for a language. The International Phonetic Alphabet has symbols for 34 different vowels. You can listen to the different sounds they represent here. 6. SOME LANGUAGES REQUIRE VOWEL HARMONY. In English, we can add an ending like –ness or –y onto any word and the form of the ending doesn’t change. I can say “the property of vowelness” or “his speech is very diphthongy.” In languages like Hungarian, the vowels of the ending must harmonize with the vowels in the word it attaches to. For example, the multiplicative ending, for forming words like twice, thrice, etc. is –szor when it attaches to a word with a back vowel (hatszor, “six times”), -szer when it attaches to a word with a front vowel (egyszer, “once”) and –ször when it attaches to a word with a front rounded vowel (ötször, “five times”). Other languages with vowel harmony are Turkish and Finnish. 7. TODAY’S ENGLISH IS THE RESULT OF MASSIVE CHANGE CALLED "THE GREAT VOWEL SHIFT." Many words we have today were pronounced very differently before the 14th century. Boot sounded more like boat, house sounded like hoos, and five sounded like feev. English underwent a major change in the 14th and 15th centuries. Words with long vowels shifted into new pronunciations. The changes happened in stages, over a few hundred years, but when they were complete, the language sounded very different, and spelling was a bit of a mess, since many spellings had been established during early phases of pronunciation. The change may have been initiated by the volume of French words that entered English shortly before the shift, or by the movement of populations with different dialects during the Black Plague. In 1969, George Perec, a member of the French experimental literature group known as Oulipo published La Disparition, a 300-page novel written only with words that did not contain the letter e. It was published in English as A Void, also without using the letter e. The Spanish translation, El Secuestro, used no a. Works created with this kind of restriction are called lipograms, explained here in an e-less lipogram.